R.G. 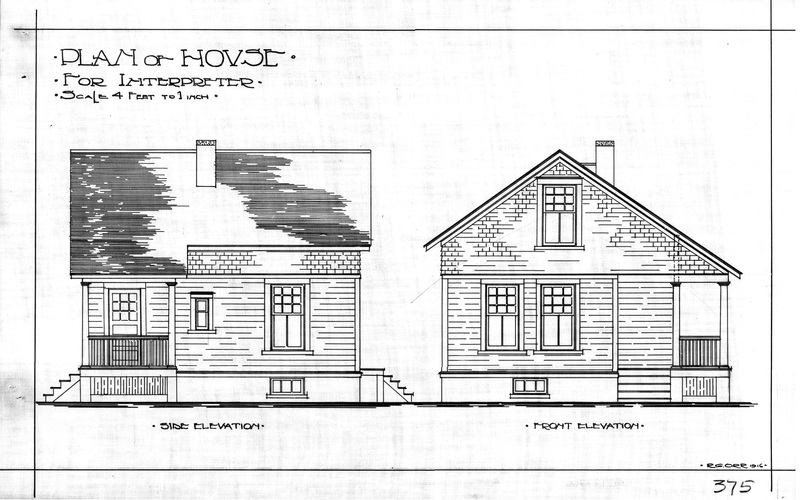 Orr, “Plan of House for Interpreter”, 1916, Library and Archives Canada. Developed mostly in the first half of the twentieth century, this “Indian” architecture was mass produced in response to the ideological requirements of eradicating Indigenous cultures and languages. It was used to represent Euro-Canadian cultural norms and enabled the government to carry out assimilative practices, thereby reinforcing a perceived association between “civilization” and the reorganization of space. Unlike the diffuseness of contemporary global spatial products, however, “Indian” architecture depended entirely on its positioning in specific places close to or on reserves or, in the case of residential schools, strategically away from reserves so as to sever Indigenous children from their communities. Rather than emerging as by-products of their legal and political contexts, “Indian” architecture was distributed heavy-handedly in gestures of all-consuming power.